The mission of Camp Milton is to provide an empowering and enriching environment in which children with neuromuscular diseases can be supported in their journey of personal development being part of a community that fosters impactful experiences and a sense of belonging. 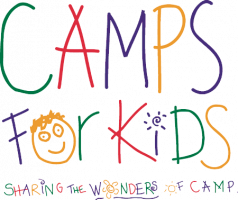 Camp Milton provides a week long overnight camp at Tall Oaks Conference Center in Linwood, KS for children ages 6-17 that have a neuromuscular disease. Camp Milton, a program of the Neuromuscular Access Initiative, was started in 2018 when our summer camp, run by a different organization, was closed. At Camp Milton we work to develop relationships, build confidence, and show kids that “yes, you can!”. Traditional camp activities include swimming, archery, zip line, and horseback riding. Our camp also has special traditions that kids count on being a consistent part of their “Best week of the year!”, those being – a talent show, a dance, bonfire songs with s’mores, along with the beloved arts and crafts. Campers are given a fun environment where they are able to develop social skills in an immersive, safe, and exciting way. Socializing with their peers can often be difficult in other environments, such as school, because their diagnosis can often create social barriers that stem from children that do not have disabilities so they are not able to relate to the campers’ life experiences. Camp offers a better quality of life by creating a familial support system and increasing feelings of happiness and being understood by the people who invest in them. Campers often refer to the week of camp as the “best week of the year” and many have also said that camp is “better than Christmas.” Due to Camp Milton recently being managed by Neuromuscular Access Initiative after no longer being funded by its previous sponsoring organization, new and more comprehensive ways of measuring camper satisfaction are in development.